Completed in 2002, the Burton Beach House [referred to locally as ‘Port Willunga Blue’] re-establishes the traditional esplanade shack model, but with a distinctly contemporary interpretation. The house’s aesthetic borrows from our beach architecture of the past: weather boards form the bulk of the cladding, with relief areas of mini-orb. The blue and white colour scheme is similarly ‘beachy’ and draws from the Greek heritage of one of the owners. In addition, it creates an immediate sense of being on holiday and of being in a house designed for relaxation. 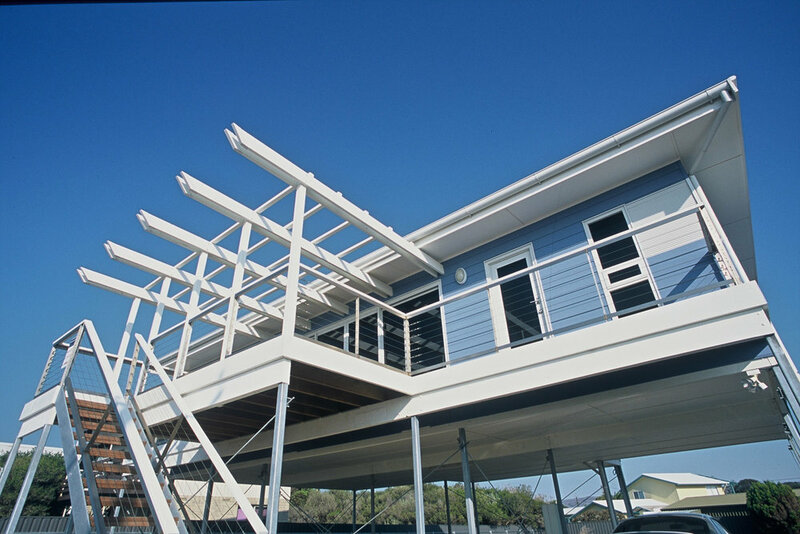 This is enhanced by the large timber deck and other beach house practicalities: an external shower and sump for rinsing; open slat stair treads to limit the amount of sand entering the house; and wide timber balustrades for resting drinks whilst taking in the view. Built on a tight budget, the house is economic in both it’s internal layout and external form. Sited on a cliff edge, it is elevated in order to achieve views of the sea and coastline. This avoids the need for a carport or garage by enabling multiple undercover car parking to be achieved beneath the house. Additionally, it provides space for hanging bathers and towels and setting up the all-important table tennis set. Being designed on a simple grid, the downstairs area can be built-in should the owners require more living space in the future. This modular design allows the central space of the house to form an open-plan kitchen, dining and living space, which then extends externally to the central deck via double sliding doors. The four modules accessed off the living space form the three bedrooms and combined bathroom and laundry, with every room in the house having a view of either sea, coast or hills.